On May 15, Eihwaz Recordings (a sub-label of Bindrune Recordings) will release an unusual split by West Virginia’s Infirmary and UK-based Aetherium Mors: The split really consists of a full four-track EP by each band. Two songs from the split have previously debuted (here), and today we bring you two more — one from each of the bands. Infirmary are a West Virginia duo consisting of guitarist/vocalist Aaron Carey (Nechochwen, Unwilling Flesh) and bassist/drummer Andrew D’Cagna (Nechochwen, Obsequiae, Brimstone Coven, Unwilling Flesh). Their EP included in this split is entitled Suffering For Eternity. 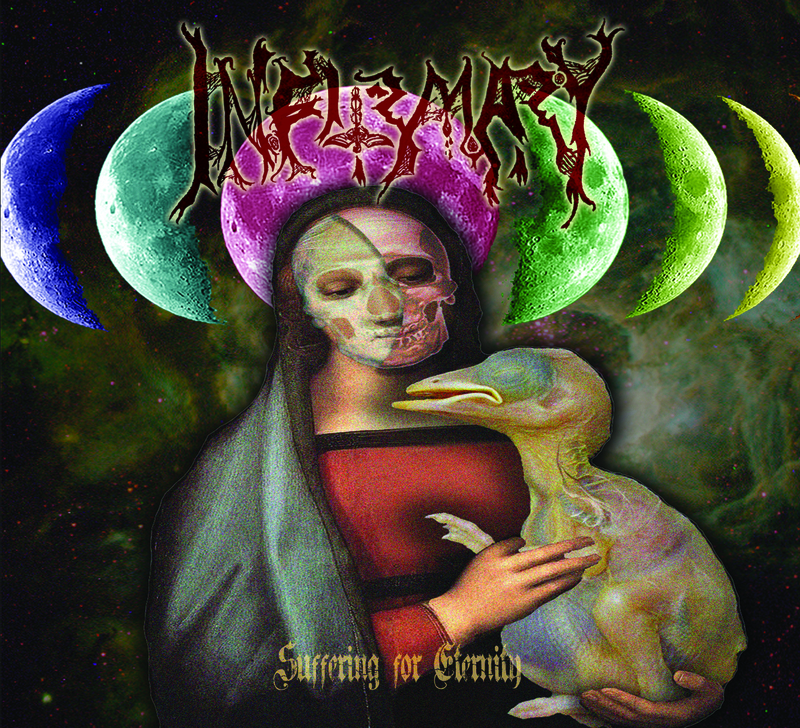 If you’re familiar with the other bands of Infirmary’s line-up, you may not be prepared for the devastation they unleash under the Infirmary name — but you will become educated when you hear our premiere of “Forced Into the Flames”, which is the first track on this striking split. The band employ a variety of old-school death metal techniques, with a bit of blackening and modern ingredients in the stew as well. The song pummels and crushes with aplomb, frequently shifting rhythms and picking styles, from grinding tremolo riffs to galvanizing heavy chugs, from a ripping attack to slow, methodical hammering. The vocalist fills the air with furious bestial proclamations and the song also includes an eerie, alien lead guitar melody that’s just further evidence of Infirmary’s success, throughout the EP, in breathing vivid new life into an age-old genre. 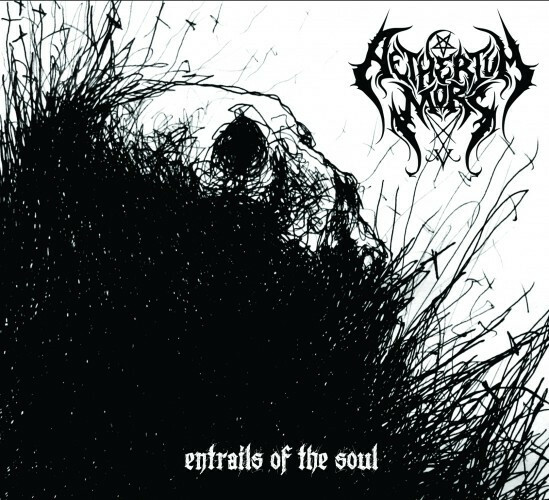 Aetherium Mors are another two-man band (multi-instrumentalist Dan Couch and vocalist/lyricist Kane Nelson) who have so far self-released a debut album in 2012 (Drenched In Victorious Blood) and an EP last year entitled Entrails of the Soul. Their part of this new split consists of remastered versions of the four songs from that 2013 EP. The song we chose to premiere today is the final track on this band’s EP — “Souls Diseased By Faith”. 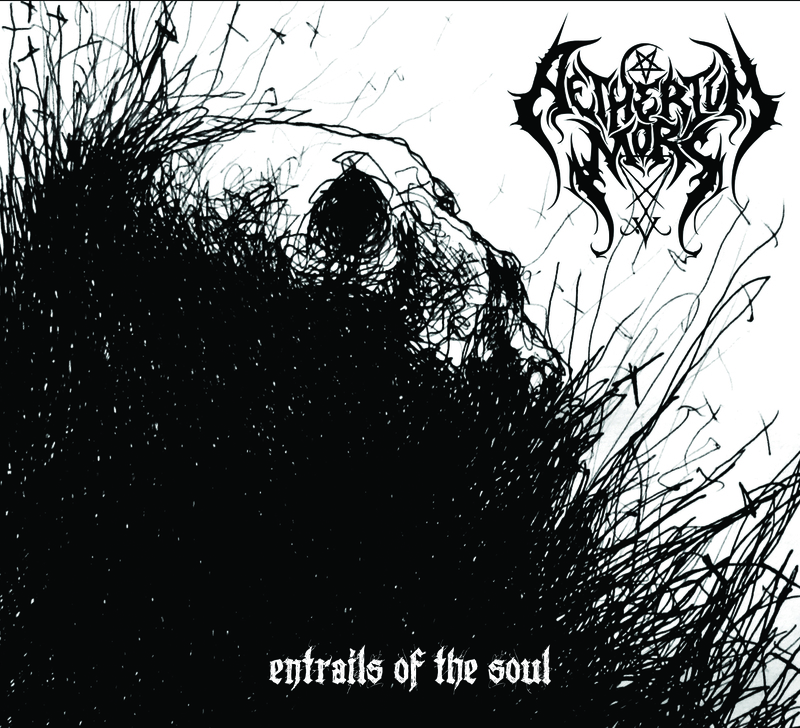 Where Infirmary brings the devastating death metal, Aetherium Mors unleashes an equally devastating black metal assault, and their musicianship is equally accomplished. The song is never less than vitriolic, but it moves between periods of dirge-like stalking and full-on storming. The band’s flailing tremolo and blast-beat attack is counterbalanced by ominous, serpentine melodies and a skittering, swirling guitar solo. The vocals are utterly caustic, blasphemous, and scathing, yet there is an undeniable sophistication in the songwriting and the instrumental performances that moves the music beyond the realm of the purely bestial. The band’s Facebook page can be found below, along with a link to Eihwaz Recordings, where the split can be ordered. Check out “Souls Diseased By Faith”.